Caimans, alligators and crocodiles are among the largest living reptiles in the world. Fierce and fearsome, they have a collective reputation for being some of the world’s most ferocious natural predators. However, while they are related to and are often confused with each other, these three subfamilies of reptiles are different. This article will discuss their similarities and variations. Caimans are members of the alligator family. The six known species of caimans inhabit the tropical wetlands of South and Central America and hunt and move around at night. Caimans are fairly small predators, averaging around 6.5 feet (about 2 meters) in length and 88 pounds (about 40 kilograms) in weight. The black caiman, the largest species, can grow up to more than 16.4 feet (about 5 meters) long, weighing around 2,425 pounds (about 1,100 kilograms). Caimans possess broad jaws and snouts and unlike many reptiles, their nostrils are not separated by a bony plate. In the wild, caimans feed on fish, birds, and small mammals. There are only two known living species of alligators: the American alligator and the Chinese alligator. American alligators inhabit the southeastern United States and Chinese alligators occupy the Yangtze River valley. Both species’ habitats are in temperate zones. On the average, American alligators are 13 feet (about 4 meters) long and weigh around 794 pounds (about 360 kilograms). 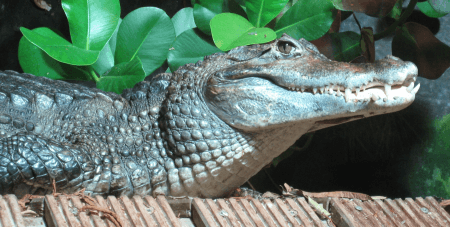 Both the American and Chinese species have broad, flat snouts that are shaped like a “U.” In their natural environment, alligators consume large fish, turtles, and large mammals such as bears and dogs. Crocodiles are the largest family in the crocodilian order with 14 living species that live throughout most of the tropics. Four species live in Central and South America; three species inhabit Africa; and another seven species are endemic to Asia and Oceania. The largest species, the saltwater crocodile of Southeast Asia, can go up to 16 feet (4.9 meters) long and weighs up to 1,151 pounds (about 522 kilograms); the smallest species, the dwarf crocodile, ranges between 4.9 to 6.2 feet (1.5 to 1.9 meters) long and weighs between 39.7 and 70.5 pounds (about 18 and 32 kilograms). Crocodiles have pointed V-shaped snouts. Crocodiles hunt larger prey, such as sharks and large mammals such as buffaloes, apes, and even humans. 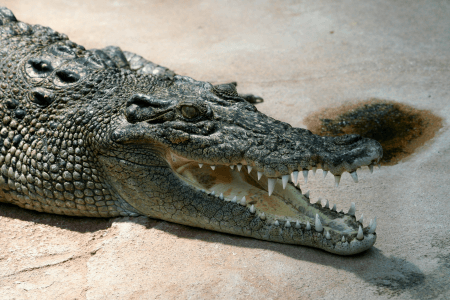 So, what are the differences between caimans, alligators, and crocodiles? While they might look the same from afar, experienced biologists give us a few clues by which we can tell them apart. Caimans live only in certain freshwater areas of South and Central America. Alligators live in the southeastern United States, with another alligator species living solely in China. Therefore, alligators and caimans thrive in temperate climates. In contrast, crocodiles live in both freshwater and saltwater habitats throughout the tropical Americas, Africa, and Asia. In fact, many crocodile species migrate farther out to sea when the weather changes. Caimans are among the smallest reptilian predators, averaging 6.5 feet in length and 88 pounds in weight. 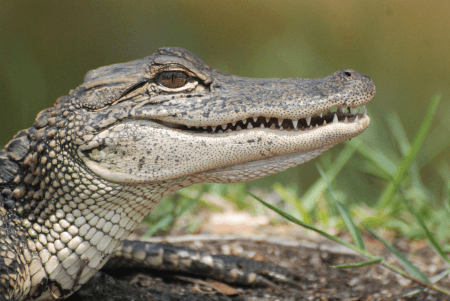 Next come the alligators; American alligators are roughly 13 feet long and weigh 794 pounds. Crocodiles are the largest of their kind; they can be as long as 16 feet and as heavy as 1,151 pounds. Caimans and alligators both have wide, U-shaped snouts. Unlike the alligator, though, caimans do not have a septum; that is, the bony partition that separates the nostrils. In contrast, crocodiles have narrower, V-shaped snouts. Caimans feed mainly on small animals such as fish, small birds, and small mammals. Meanwhile, alligators consume large fish, turtles, and large mammals. Crocodiles generally eat whatever comes their way; they are known to attack animals as large as sharks, buffaloes, and great apes. There are also reports of crocodiles attacking and eating humans.